The Century Resources web store is up and running! Click on the link and start shopping! Be sure to enter the Fairbanks shopping code (6337) and the profit goes to our account. If you enter a student's name in the appropriate box, that student will receive credit towards their prizes for anything you purchase. The best thing about the web store is that you can purchase many items that are not on the brochure, including flower bulbs, scented candles, personal care items, kitchen items, and even personalized clothing and other items.! All profit from the web store benefits the Fairbanks music department. Customer code is 6337. Purchases will be subject to sales tax and shipping, so the best way to get your quality Century products it to purchase from a band member, but If you can't get to a band member and still want to purchase and support the Fairbanks Band Program, the web store is the way to go. Finally, band and choir members can log in at the web store and send personalized emails to family, friends, and neighbors to alert them about our sale and direct them to the web store. 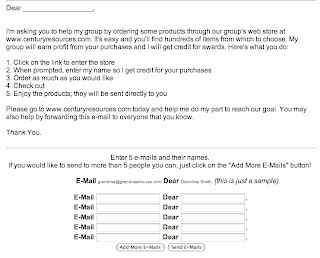 For every five emails you send through the Century store, you are entered in a company-wide drawing for a Nintendo Wii, iPod Touch, or $250 cash!